I first posted this recipe back in November of 2012 – where has the time gone?! I wanted to share it again because it’ll be simmering away in my kitchen on September 29 when the family descends on my home for Kol Nidre – the evening before Yom Kippur. It’s the perfect meal for the celebration – warm, nourishing and hearty! The week following Thanksgiving is tough for me. All our out of town guests depart, one after the other… my house feels suddenly very quiet (but cleaner) … and I am stuffed with turkey, sweet potatoes, pie, leftovers and heavy food in general. Because I feel both full and empty at the same time – I always turn to warm, healthful, vegetarian soup containing vegetables and grains. 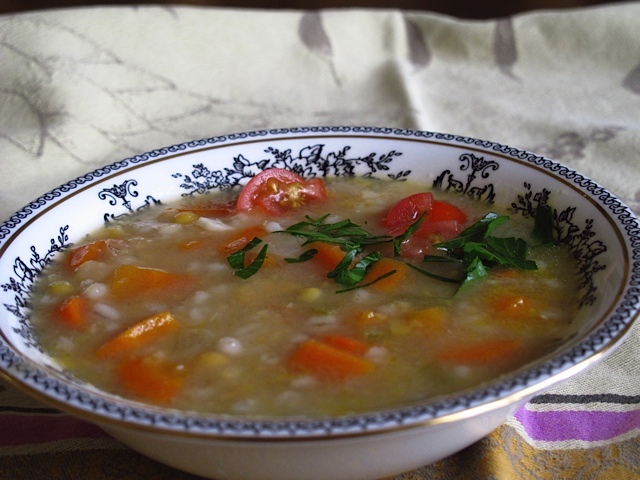 My standard go-to: yellow split pea soup with barley. It’s an old standby, and after years of playing with the original formula, I have now perfected it to the point where it pleases me without fail. Plus – it’s so simple … just serve this soup after Thanksgiving with huge slices of whole grain bread and a simple green salad and call it dinner. Bring the first five ingredients to a boil, turn heat to low and simmer covered for 40 minutes or until the split peas and barley are soft. Remove the bay leaf. Meanwhile, sauté remaining ingredients for eight minutes in a frying pan on medium heat. Sautéing the vegetables give a different dimension to this soup and any soup for that matter. When vegetables are a bit tender and barley/yellow split peas are soft, add the vegetables to the soup. Cover and continue cooking together on low simmer for 20 minutes. This can be done a day or two ahead of time – the soup thickens a lot when it is cold. Heat and season the soup before serving with fresh ground pepper and more salt if needed to taste. (I did not add more salt). I add a pinch of dry mustard as well and ¼ tsp of sesame oil while heating the soup and I top the plated soup with some chopped fresh parsley and diced tomato if I have it around. To cool soup quickly so you can store it in the refrigerator and avoid leaving it out at room temperature, fill a large sink with ice and water (I happily have an ice maker in my freezer). Put the pot of soup in the sink so the ice water is above the “soup line” and stir occasionally. After a mere 15 minutes it cools down and is fridge ready. I use this method for anything that is hot and needs refrigeration to avoid leaving things at room temperature. If you happen to have a chicken carcass or chicken bones left over (I always freeze mine when I roast chicken or make chicken breast on the bone) this can be added to the soup with the barley and split peas at the beginning. If you do this, remove the bones as you add the carrots and celery. The soup, prep and all, takes about an hour –so I always use the time while cooking takes place to do other kitchen prep or chores. Today I made chicken sandwiches for lunch, salad dressing for the week, I rolled and baked crackers (made the dough last night), and made enough steel cut oats for the week as well! 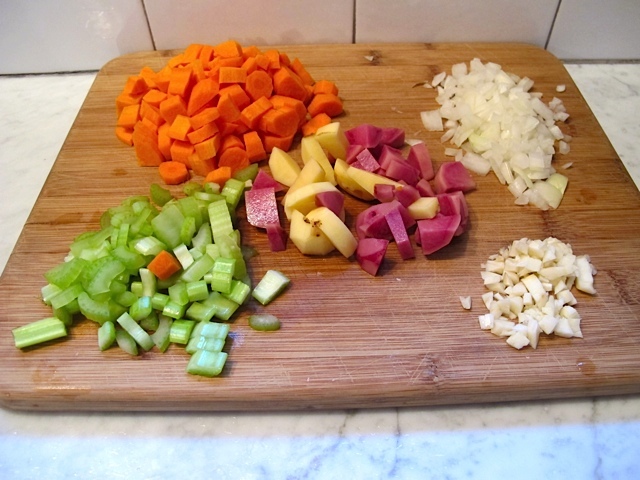 In my picture of ingredients, you’ll see I used a small purple fleshed potato and a small Yukon gold potato instead of half a potato – next time I would only use Yukon gold potato as the purple potato had a weird color in the soup.